Battles of Westeros is played over one of several included scenarios, called battles. Each of these has a battle plan that dictates the formation of the map (called the battlefield), starting positions of each House’s units, starting resources, special rules, and victory conditions for the game session. A battle is played over several rounds, with each round consisting of alternating player turns. The goals a player needs to accomplish to win a game of Battles of Westeros can vary (some battles require players to earn a certain number of victory points, while other battles require a player to take and hold strategic positions on the battlefield), but this collection of available scenarios, along with the ability to make your own exciting battles with the double-sided map board and over thirty map overlays, gives Battles of Westeros a wealth of replayability! Battles of Westeros also offers plenty of strategic complexity, resulting in a satisfying number of compelling choices in every game. For example, each player has a special randomized Leadership Deck, consisting of unique tactics and abilities; this deck will change based on the scenario being played and characters present. Is Jaime Lannister on the battlefield? If you draw the appropriate Leadership Card, he can order nearby troops to aggressively rush their opponents! Is Eddard Stark guiding his forces into battle? Special flanking maneuvers enter your Leadership Deck, to potentially be drawn into your hand. Battles of Westeros also features a level of realism that immerses you in the most significant conflicts of the War of the Five Kings. Each plastic figure base, which holds your infantry, archer, cavalry, and kennelmaster units, has a slot for a banner pole – a small flag-bearing attachment. The plastic banners that attach to each unit bear the crest of that unit’s house, and their orientation on the pole indicates at a glance whether that unit has been ordered yet. In addition to the intuitive and useful game effect this provides (differentiating the units you’ve activated from those you haven’t), the sight of your army’s banners spread impressively across the gorgeously designed game board will give you the sense that you are the clever Tywin Lannister, Lord of Casterly Rock... or the stoic Robb Stark, with his direwolf Grey Wind at his side! 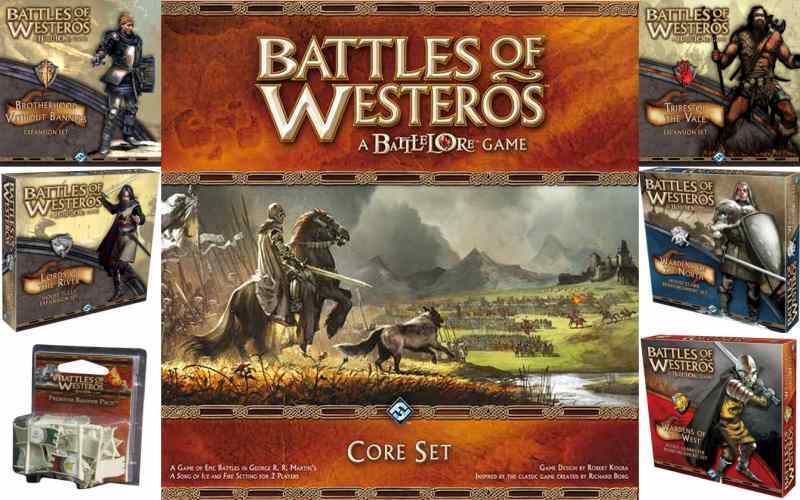 Note: Wardens of the West is not a stand-alone game, a Battles of Westeros Core Set is required to play. Pledge your allegiance to House Lannister and carry the lion's banner into battle. To help House Lannister's campaign against House Stark, use trained pikemen, conscript crossbowmen from House Clegane, or pluck farmers from their fields to form a militia. Will you heed the call? 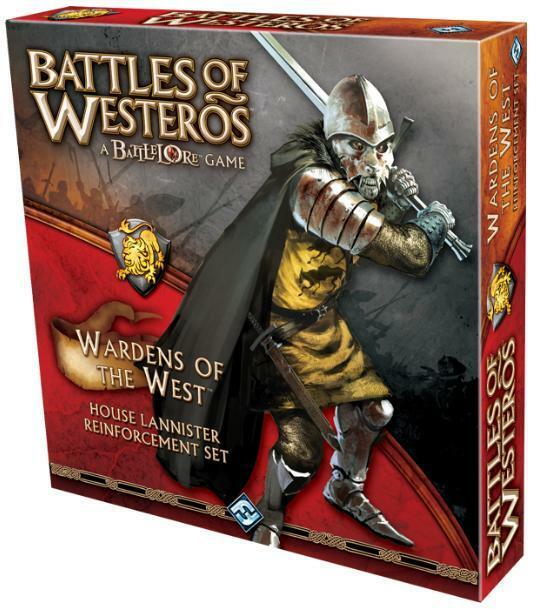 The Wardens of the West expansion adds more Lanister commanders and units to the Lannister forces of the Battles of Westeros core set. Players can use these new units to take part in battles set in Geroge R.R. Martin's Song of Ice and Fire fantasy series or make their own fantasy battles. Note: Wardens of the North is not a stand-alone game, a Battles of Westeros Core Set is required to play. All across Westeros, the Great Houses prepare for war. The Starks to the north have taken up arms and declared a new King in the North. Meanwhile, various contenders and usurpers stake their claim for the Iron Throne, vying for control of the Seven Kingdoms. It is a time for armies to be gathered. Honor your allegiance with House Stark and carry the wolf’s banner into battle. Summon the courage to ride with Robb Stark in his campaign against House Lannister. Call upon the thundering lancers of House Umber, the shieldmaidens of House Mormont, and the trident bearers of House Manderly. Will you heed the north in its hour of need? 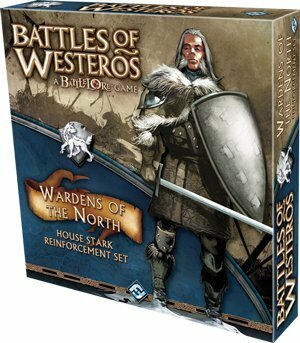 The Wardens of the North reinforcement set adds more Stark commanders and units to the Stark forces of the Battles of Westeros core set, including the formidable Smalljon Umber, loyal Rodrik Cassel, and resourceful Galbart Glover. 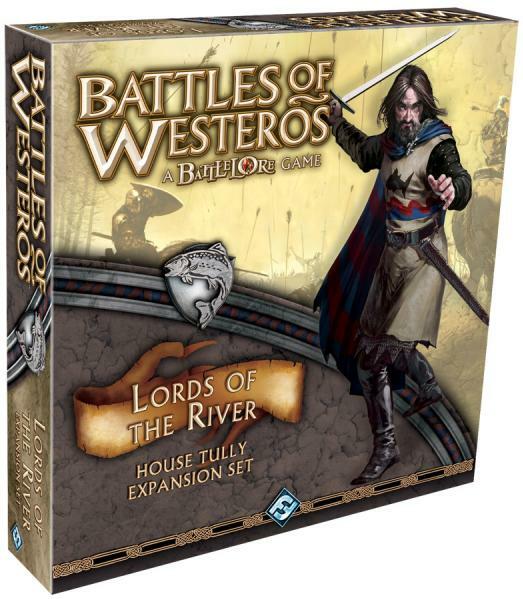 Note: Lords of the River is not a stand-alone game, a Battles of Westeros Core Set is required to play. Included in Lords of the River are are three new commanders and three new unit types, all loyal to the leaping trout of House Tully. Lead your troops with Edmure Tully, Brynden “Blackfish” Tully, or Marq Piper, and lay waste to your foes with Tully River Riders, Tully Longbowmen, and the Warriors of Wayfarer’s Rest. New keywords such as Riverborn and Indirect Fire will give you an edge when fighting near rivers or hindering terrain, representing House Tully’s familiarity with fighting in the Riverlands. 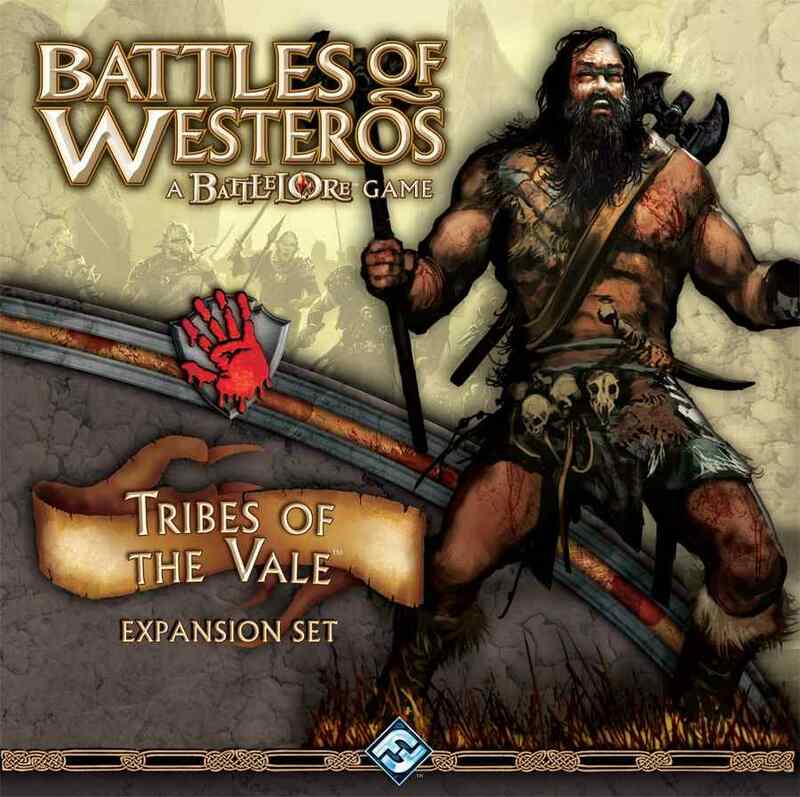 Note: Tribes of the Vale is not a stand-alone game, a Battles of Westeros Core Set is required to play. Note: You must have Battles of Westeros in order to use this Premium Banner Pack. The war is heating up in Westeros, and additional support is needed to ensure your house remains a contender in the game of thrones. As the battles become more frequent, new banners would go a long way in raising your army's morale and establishing a notable presence on the battlefield. 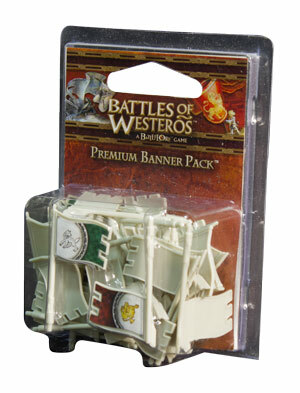 Premium Banner Packs replace the banners included in the Battles of Westeros Core Set. Each pack comes complete with enough material to completely enhance your House Stark and House Lannister forces. Each pack features 44 plastic banners with accompanying sticker sheets that coincide with the green, blue, and red banners for both Stark and Lannister. 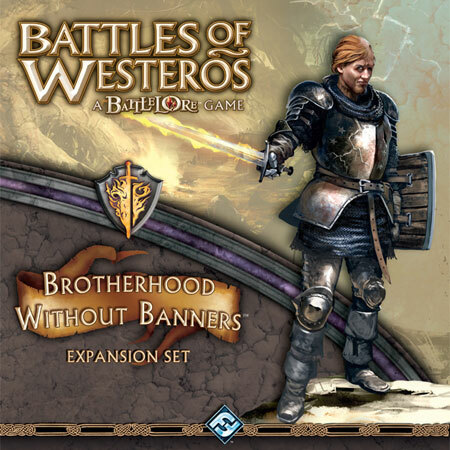 These banners are designed to enhance your Battle of Westeros experience while also allowing players to supplement their Core Set material with additional banners of your own choosing. These new banner packs are also great for players looking to create their own scenarios. 44 plastic banner poles with sticker (22 for both Stark and Lannister) to replace and enhance those found in the Battles of Westeros Core Set. Note: this is not a stand-alone game. 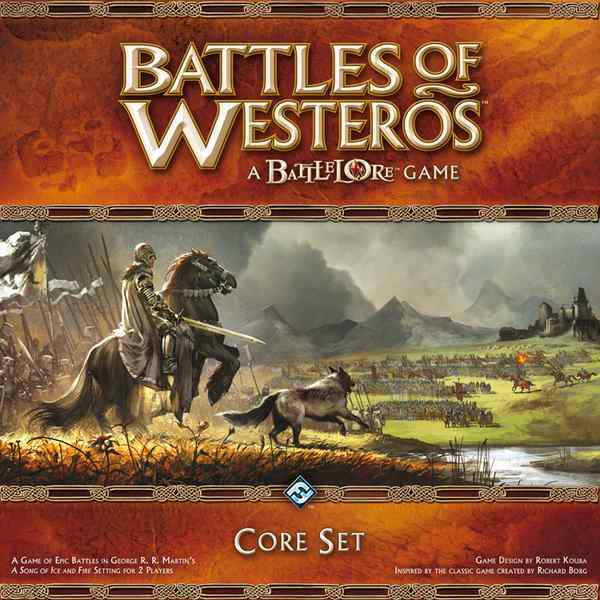 A copy of the Battles of Westeros core game is required to play. Brotherhood Without Banners introduces a new ally faction to Battles of Westeros that players can use to supplement any of their existing House armies. Brotherhood Without Banners includes a Rules and Battle Plans book with 4 new scenarios, 36 plastic figures, 30 cards, 5 terrain overlays, and 36 token. 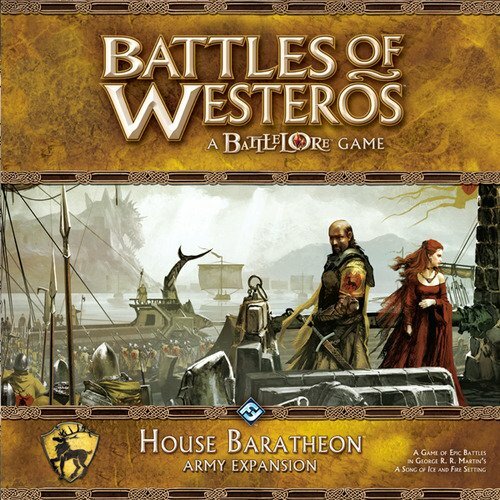 House Baratheon is not a stand-alone game; a copy of the Battles of Westeros core set is required to play.